Published on 11 Sep 2014 at 9:28 pm. Apple’s iPhone event 2014 is here and brought us news on the iPhone 6 and Apple’s first smartwatch. First let me start out with a little rant — this was the worst stream I’ve ever experienced, and I’ve used Real player. Cut out many times, foreign language feeds over the main audio, only available on Apple devices. Apple needs to hire out for these streams. Apple has finally released a bigger iPhone! 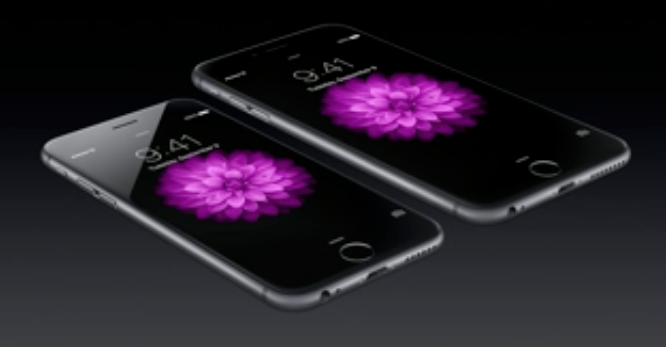 The new iPhone 6 comes in your standard size, while the iPhone 6 Plus which has a 5.5″ screen. The iPhone 6 Plus sports a 1080p resolution (1920×1080). At 1080p the resolution is the same as the S5, only with a wider screen and thus a lower DPI. Both models are skinnier than the iPhone 5 which was 7.6 mm tall. The iPhone 6 is 6.9 mm while the 6 Plus is 7.1 mm. Both versions sport the new A8 chip which is 25% faster and 50% more energy-efficient. This chip does support 64-bit. They also support a new FaceTime HD camera with f/2.2 aperture to allow in more light. This camera boasts DSLR-like camera features. Networking wise the both support voice over LTE. Both versions come with iOS 8. iOS 8 includes many great new features like widgets, customizable keyboards, and health tools which we covered earlier. The iPhone 6 is priced at $199 for 16 GB with a two-year contract. The iPhone 6 Plus is $299 for 16 GB. They are available for preorder on September 12. Apple has finally introduced an NFC chip the iPhone. This NFC chip is at the core of the Apple Pay feature that makes it very simple for you to make payments at any store that supports mobile payments. Apple highlighted Whole Foods, Disney, and the Apple retail stores as vendors that support the new Apple Pay. Groupon, OpenTable, and MLB will integrate Apple Pay directly into their apps. Apple Pay comes as a free update to iOS 8 in October. The Apple Watch is the name of Apple’s long rumored smartwatch. Long time readers may remember we first talked about this smartwatch back in February of 2012. The Apple Watch comes in a several straps and bodies based on the type of version you choose. The screens are made of sapphire. 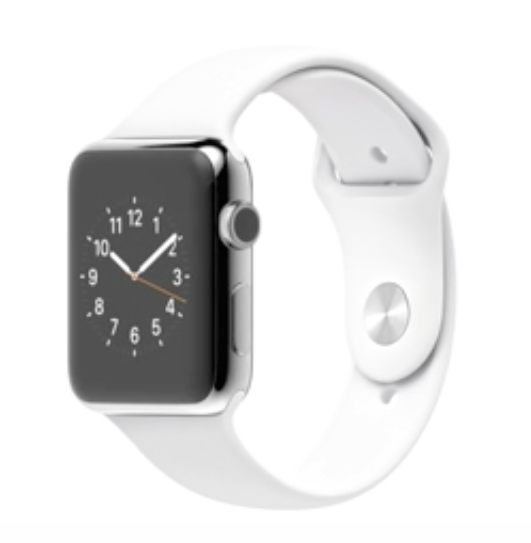 All Apple Watches come in a rectangular design. The home screen is different compared to the iPhone and iPad. It uses a series of smaller circles at different locations. The Apple Watch can detect your heart beat, and includes support for GPS and Wi-Fi. As with other smartwatches you can download custom faces to change the clock display. One feature unique to Apple Watch not supported by Android Wear is the ability to natively draw on the screen and send it to another user. The Apple Watch is not a standalone device. You must have an iPhone with you for features to work. 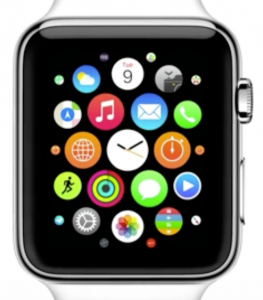 Apple Watch does not use pinch to zoom because that would obscure the content. Instead it uses a rotary dial along the side of the watch. There are three different styles of Apple Watch. The basic edition, the Sports edition and the Apple Watch Edition. The Sports edition is more colorful and includes an aluminum case that is stronger than standard alloys, yet light and durable. The Apple Watch Edition is made of 18k gold that is twice as hard as standard gold. Each of these editions come in larger and smaller sizes to help adjust to your wrist. There was no mention of battery life. Presumably Apple wants to work on this because this is a known area of concern with most wearables. The Apple Watch works with the iPhone 5 on up and starts at $349 and will be available early next year. So were you impressed by what you saw at this year’s iPhone event? Are you going to get the iPhone 6 or the iPhone 6 Plus? Will you get any of the new Apple Watches? If so which version? This post was originally published as iPhone Event 2014 News for Brand Builder Websites.